- Health regulation articles 5162 and 5170. - Article 4 of the decree n°87-361 of 27th May 1987 concerning workers protection at work. Normalised labels in accordance with ISO 3864 and European directive 92/58/CEE. 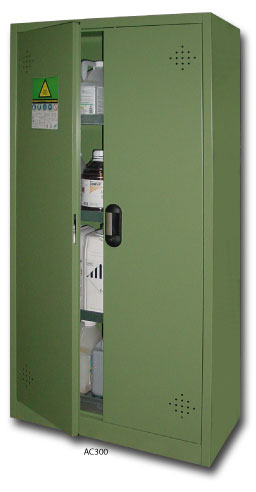 The cabinets insure safety, security and control of pesticides. Especially designed for pesticides and other agricultural che- mical products. Farms, nurseries, parks and recreation facilities can safely store pesticides. Green epoxy paint RAL 6011. - Normalised labels for individual equipment of protection. - Anti-poison centre phone numbers. 4 adjustable retention shelves/base through (50mm height). Double door with key locking. Additional retention shelf/base through (ref. ESAC150 or ESAC300, see model). Perforated cover plate for retention shelf/base through (ref. CAC150 or CAC300, see model). Industrial absorbing mat (ref. JF10). H x L x P (mm) Internal dim. The manufacturer keeps the right to modify technical characteristics without notice. Edition 03/2009.